Animal organs. Excretory system. Atlas of plant and animal histology. The excretory system consists of several organs and structures that may have diferent features depending on the animal species. Its main function is to eliminate by filtration waste products resulting from cellular metabolism or incorporated from the environment, for example, during feeding, salt excess in seabirds, etcetera. The main excretory system in animals is the urinary system. The urinary system is composed of the kidneys, in which urine is produced, ureters, urinary bladder, and the urethra. An initial filtration of the blood is produced in the kidneys. Some of the molecules from this filtration are later reabsorted and returned to the blood vessels. After this process, the resulting liquid, called urine, is collected in tubes of increasing diameter: the collecting ducts, the calyces, the renal pelvis and the ureters. The ureters arise from the kidneys and transport urine to the urinary bladder, which is a temporary storage compartment. Finally, stemming from the urinary bladder, the urethra is the duct through which the urine is evacuated outside the body. 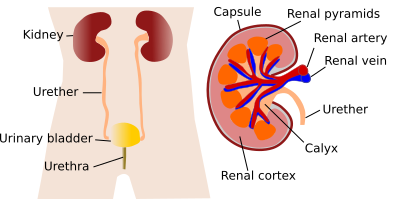 The kidneys are covered by a connective fibrous capsule under which the cortex is located. The medulla is the inner part of the kidney. Cone-shaped structures called renal pyramids are observed in the medulla. The structural and physiological unit of the kidney is the nephron. In fact, the kidney is made up of many repetitions of this structure. The nephron consists of the renal corpuscle, where the first filtration of the blood takes place. This filtrated solution is channeled to the renal tubule. Several segments can be distinguished in the renal tubule: a proximal tubule (divided into convoluted and straight portions), an intermediate tubule (divided into descending and ascending regions), a distal tubule (divided into convoluted and straight portions) and a connecting tubule. The straight portion of the proximal tubule, the intermediate tubule and the straight portion of the distal tubule form the so called loop of Henle. The distribution of nephrons and their tubules follow a highly organized model that can be seen with a magnifying glass or macroscopically. As a result, the glomeruli and the convoluted portions of the proximal and distal tubules form the renal cortex. 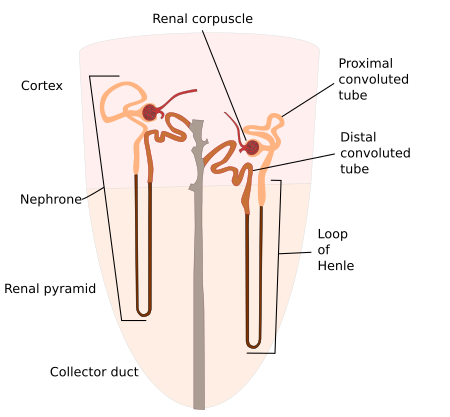 At the same time, the Henle's loop and the collecting ducts confer a typical organization to the medulla by forming the renal pyramids. The renal vascular system is quite complex. The renal artery enters through the renal hilum and branches out profusely in afferent arterioles before forming the glomerular capillary tuft. The efferent blood vessel is not a vein but an efferent arteriole, which leaves the glomerulus by a point near to the afferent arteriole. These arterioles form straight vessels that irrigate the medulla and then continue with the venous rectus vessels. All of them gather in increasingly larger veins to exit the kidney through the renal hilum in the form of a renal vein. The urinary system, besides the nephrone, is formed by all the hollow ducts and organs that transport or store urine, including the renal pelvis, the ureter, the urinary bladder and the urethra. All of them, with the exception of the medial and distal portion of the urethra, are compose of a mucosa formed by a transitional epithelium (urothelium) and by a subepithelial connective tissue. The transitional epithelium is characterized by its adaptation to changes in volume that occur mostly in the urinary bladder. A smooth muscle layer is found below the mucosa, and finally a wrapping layer of connective tissue known as adventitia. The urinary bladder is a container for urine, in which the ureters from each of the kidneys converge, and from which the urethra emerges. The wall of the urinary bladder has the capacity to form folds when it is empty, and to stretch when it is filled. The urinary ducts show sexual differences, especially concerning the urethra. While in the woman the urethra is a tube for expeling only the urine out of the body, in the man it also has to expel the sperm. That is why it is also known as the uroseminal duct. This functional difference implies a difference in length: 3-4 cm for women and 20-25 cm for men. In addition, there are differences in the type of epithelium that covers the interior of the urethra, and in the associated glands.